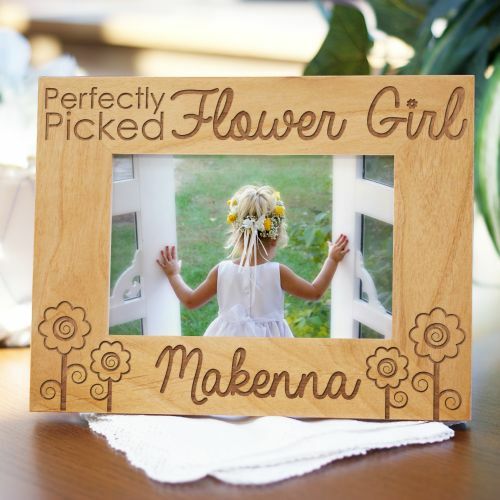 Personalized Engraved Flower Girl Wedding Wood Picture Frame. A flower girl is Precious and sugar sweet fit for a princess just darling memorable on your wedding day. Picture frame is perfect in holding your special photo and make the perfect family keepsake with special wordings. Picture Frame perfectly blends in with any home or office desk or table decoration. The picture frame is also perfect for: wedding gifts for all your Flower Girls in thanking them for being apart of your special moment. Wood Picture Frame comes in three sizes, please choose from, 4”x6”, 5”x7”, and 8”x10”. Easel back allows for desk display. Engraved personalization features the natural wood grain color. Personalize your Picture Frame with any Name up to 12 letters.